The first Friday of 2014 delivered several quality hoops matchups; one of which a showdown between Nathan Hale and host Ingraham. Both teams are jockeying for position in the highly competitive Metro League. Marques Chinn’s Ram squad is undersized, but fortunately makes up for it with an active guard duo of Jovan Owens and D’Olajuwon Swanks. The Raiders also boast a strong pair of guards in Tim Iwuhoa and Gadisa Margarsa that have size and athleticism. Ingraham shot out of the gates with a 10-0 run sparked by Owens’ perimeter shooting. Hale cut into the deficit with a pair of triples by Steven Shpreyregin, but Owens struck back in a big way by draining a half-court shot at the buzzer to close out the first quarter with a 20-13 lead. The second quarter was a coach’s nightmare for both sides as poor shot selection and unnecessary fouls plagued both sides. The Raiders cut into the Ram lead marginally in the second quarter by edging the home team out 9-7 in the second frame. At the half, Ingraham led 27-22. Nathan Hale certainly received a stern halftime talk by coach Chris Weakley for a relatively sloppy first half because the Raiders put together an impressive second sixteen minutes. 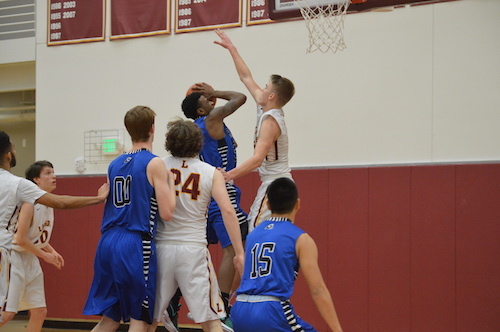 Ingraham’s inability to score in the paint from their forwards extended a scoring drought into the third frame as the Rams only netted six points. NHHS started knocking down jumpers in transition through superior ball distribution by Tim Iwuhoa. The fourth quarter featured a shooting spree from Hale guards Shpreyregin and Nate Hartman as both seniors drained two from downtown. Ingraham could not recover from the deficit despite a late surge by Raymond Horne who scored twelve of his eighteen in the final quarter. Final score: Nathan Hale 64 Ingraham 50. Even an 18-0 splurge in the fourth quarter by the Ingraham Rams was not enough to upset the bigger Cleveland Eagles. In the first contest of the night at Memorial Stadium in Seattle, Cleveland jumped out to a comfortable 34-0 lead through three quarters and coasted to a 34-18 victory. The game began with an onside kick by Cleveland, recovered by the Eagles in Rams territory. The Rams forced a turnover on downs, but fumbled the ball two plays later on their own 3 yard line to give Rachaun McConico an easy rushing touchdown on the next play, his first of two on the day. Unfortunately for the Eagles, McConico had to leave the game after his second touchdown later in the first quarter due to a shoulder injury. But that didn’t stop the Cleveland, who continued to attempt onside kicks and put pressure on the Rams special teams. Rams turnovers didn’t help their cause in the first half either, with another fumble and an interception Cleveland was able to jump out to a 26-0 lead at half. Another Ingraham fumble on their first possession of the second half allowed then Eagles QB Gartiez Darden to throw a touchdown to Dale Daniels, Daniels’ second score of the game. Ingraham was unable to put together a promising drive in the third quarter, and trailed 34-0 going into the fourth. With Cleveland’s first string still on the field early in the fourth, Ingraham began their comeback. Senior Nate Han was able to punch in a rushing touchdown, and Ryan Kyle threw a touchdown pass to Louie Richardson to cut the lead to 34-12. Sophomore Emmery Porter added another rushing TD for Ingraham later in the fourth, but at this point the game was securely in the hands of Cleveland, who took the contest 34-18.